Intraboom is an all-in-one digital workspace designed for seamless internal and external communication which allows users to collaborate, communicate, schedule and manage tasks, share files and media, and more in one place. 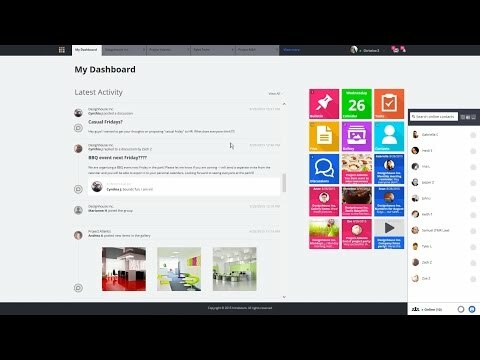 Intraboom serves businesses and teams to create better engagement and workflow with key features such as an activity dashboard, which pulls together all the activities from all groups and projects into a single screen and activity feed. The bulletin helps keep everyone informed with post notifications for the entire group to view and comment on. All members of a group can view all upcoming events on the shared calendar, allowing people to effectively share ideas and knowledge that may be relevant to an event. Tasks can be assigned to one or more responsible persons with due date tracking, helping keep projects on track. Intraboom's built-in cloud storage stores files on the Microsoft Azure cloud, allowing users to create file structures with folders and sub-folders for each group. The gallery allows group members to share photos and videos, and discuss them in real time, including a preview function to review hundreds of photos in one glance. The discussions function allows any group member to start a new discussion on any topic, keeping all replies organized in one thread. Intraboom's messaging system includes an online chat tool, private messages, and also text messaging to mobile phones. The system adapts to effective group messaging as well as one-one-one messaging. All internal and external contacts are organized and easily accessible. I use it dialy I can stay in touch with my coworkers and share ideas. Is a must tool we use everyday at the office. I can stay in touch with my coworkers and share ideas. Is a must tool we use everyday at the office. I would like to have it as an app. I heard Is only available for apple users. Android users will like to have this as an app. Thank you for taking the time to review Intraboom on Capterra - we really appreciate it! We are happy to inform you that we have launched the first version of our Android app a few weeks ago - you can download it for free on the Google Play Store! Keep an eye out for updates as well (or set up your phone to run auto updates on the app) - we are running imporvements on the app periodically as we continue to receive feedback. Thanks for being a valued Intraboom customer! If there is anything we can help you with, please contact us at support@intraboom.com. Intraboom gives you the flexibility to organize your team and be in one mindset for projects. The ability to relate to your team with discussions, bulletins, and tasks. I can connect with my team at any time through a discussion to develop ideas pertaining a specific project. Using the bulletins, I can remind of upcoming event and due dates for projects. I can keep the team on track by utilizing the task area and give due dates. I like the overall simplicity and fast process of making everything user friendly for the administrator and the rest of the team. You can count on being productive when utilizing Intraboom. Organization is a must in order to become productive and efficient. When utilizing the application, the dash board could get a bit cluttered when one has many groups. The dashboard could get a little declutter if you could choose to open and close the messages that are seen on the dashboard. Over all the application has a good flow. I truly would love to see the ability to be able to connect with social media and websites. This would be very convenient and assist a lot with time management. This feature can help take Intraboom to the next level. I hope to see in the near future such features that can facilitate also the ability to have video chat discussions. Thank you for taking the time to review Intraboom on Capterra - we really appreciate it and will be sure to take your feedback into account in our product development! If there is anything we can do for you, please feel free to contact us at support@intraboom.com. Thank you for being a valued Intraboom customer! Intraboom has been a great social media platform to bring our company together. I like the fact that this intra system brings our staff together, allows us to post pictures and experiences live for others in our company to relate. It brings us together in a positive way and inspires us to connect. Sometimes the system will have an error and pictures will upload more than once. Some type of like button would be great. A more up to date step by step instruction manual (electronic) would be great for our users. Thank you for submitting your review on Capterra for Intraboom, we really appreciate your feedback! We are looking into the issue you mentioned with picture uploads as well as your other suggestions - keep an eye out for updates! In the meantime, if there is anything we can help you with, please send us a message at support@intraboom.com. Intraboom has been an excellent handy and user-friendly tool to connect, share and co-create. It is simple to use and intuitive. The interface is simple and clean. Easy to create teams and add members. The process of creating a new team and inviting new members to it. The ability to share and email documents and photos from within the app should be easier. Hi Dayaprasad! Thank you for taking the time to review Intraboom on Capterra - we really appreciate your feedback and will be sure to take your comments into account in future development! In the meanwhile, if there is anything we can help you with, please contact us at support@intraboom.com. We thank you again for being a valued customer and hope you keep enjoying Intraboom! I use Intraboom to manage projects at a hospital within a larger health system. The user interface is straightforward and easy to use. It makes keeping up with project deadlines and communicating across multiple departments extremely simple. I also enjoy getting reminders about deadlines and discussing project deliverables within the app. I cannot find anything I do not like about this app. Maybe just add more functions or make it more customizable for user preferences. Hi Christina! Thank you for taking the time to review Intraboom on Capterra - we really appreciate it! If there is anything we can help you with, please contact us at support@intraboom.com. The solution provides a simple and engaging platform that helps eliminate the need to toggle between multiple apps, helping to make the mobile working experience seamless. Intraboom's bulletin feature helps keep everyone informed, creating maximum engagement with post notifications for the entire group to view and comment on. Coordinate events within the shared calendar, allowing all members of a group to view upcoming events for increased transparency. Intraboom helps keep projects on track to assign one or more responsible persons, watchers, due dates, and more to each task, with options for filterting and reassignment. Get the full range of Intraboom's functionality on the mobile app in a self-contained ecosystem, and manage all internal and external communication in one place. Below are some frequently asked questions for Intraboom. Q. What type of pricing plans does Intraboom offer? Q. Who are the typical users of Intraboom? Q. What languages does Intraboom support? Q. Does Intraboom support mobile devices? Q. Does Intraboom offer an API? No, Intraboom does not have an API available. Q. What other apps does Intraboom integrate with? Q. What level of support does Intraboom offer? Q. Which apps is Intraboom compared to most often?